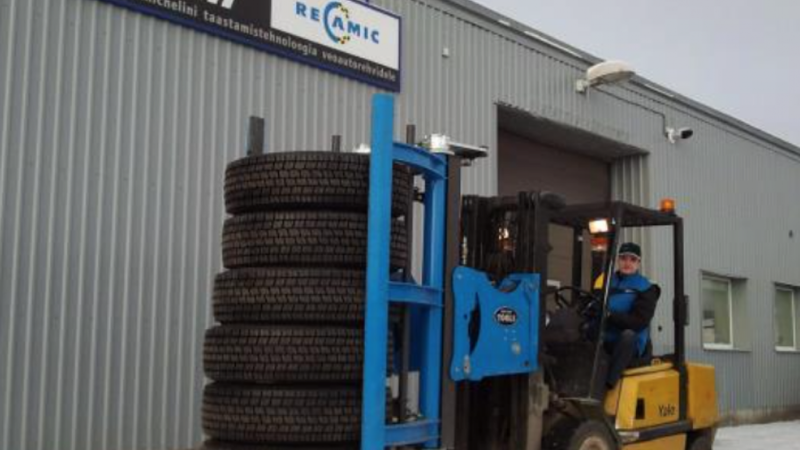 Sepa Rehv OU is Recamic retreader and their neighbouring sister company in Tartu, Hinkus AS, is one of the biggest tire dealers in Estonia. Their main focus is on retreading truck tires, selling and servicing other tires. They know what it takes to run a warehouse efficiently and organized in order to stay competitive. Both companies are now using the Easy Stacker 1200. Once the decision to invest in the Easy Stacker 1200 was made, it was promptly supplied by the dealer for the Estonian market, Awre OU. „Also, now only 2 persons are needed when loading the truck or warehouse with truck tires. We are saving at least 50%,“ he states with a smile. Now his companies can sell more tires and service more customers. They do not need to worry about safety and tires running loose in the warehouse.